September 21 2006 I left Wellington for the U.K to spend time with my daughter Esther who works as a legal journalist in London. During my stay Esther and I visited Brighton to see my penfriend Pamela. 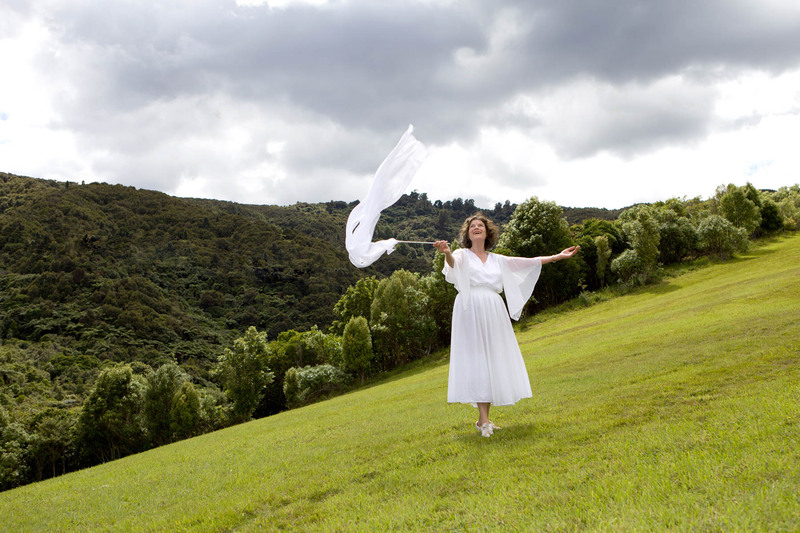 I had last seen Pamela when my husband Noel and I went on a memorable overseas trip to Europe in 2002. Pamela was very happy to see us and to meet Esther for the first time. On the way to Pamela’s home we enjoyed the delightful walk along Brighton beachfront on a truly glorious sunny day. Amongst the stalls and Cafes along the beach I noticed the same charming Merry go round playing ‘Sussex by the sea’ that I remembered from my last visit. On Sunday Esther and I went on a long walk to Berkley Square. I have always loved the song ‘A nightingale sang in Berkley Square’ so I was curious to see this Square! I discovered it is a Park with many very old tall trees but I did not see or hear any signs of bird life! All Souls Church was walking distance away so we attended a late afternoon service. The hymn singing accompanied by a full orchestra was glorious! Situated in the heart of London this evangelical Anglican Church has many outreaches to minister to needs in the community. On a day when Esther was at work I joined thousands of others at Buckingham Palace to watch the Changing of the Guards. Riders on shiny black horses followed by a marching Band (players wearing red jackets and tall black bearskin helmets) is always a spectacular sight and sound! On a Tour around London on the Big Bus I stopped at the National Gallery and admired the originals of many Constable paintings. As I had never seen squirrels before until I went to the U.K. in 2002, I utilised some spare time (while Esther was working) by a walk to Finsbury Park near where Esther lives. I was delighted to see four squirrels! For Londoners they are a common everyday sight. On 21 September I met up with my other penfriend Jean from Cheshire. We spent three memorable days in Devon journeying from London to Honiton on the Great West train. Devon has beautiful countryside with lush green meadows and hills of forest. 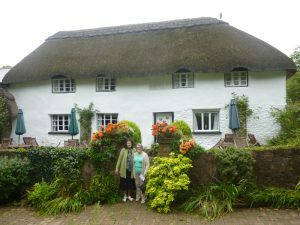 From the lovely beach resort of Sidmouth a bus took us through charming Saxon villages to our Bed and Breakfast accommodation, an historic thatched roof cottage. Much of the cottage is 500 years old. Situated in farmlands with colourful English cottage gardens this venue is idyllic! 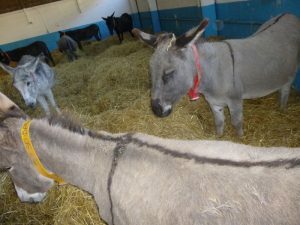 Jean for many years has sponsored a brown donkey called Cocoa. The motivation to go to Devon was to visit the Donkey Sanctuary at Sidmouth. This Sanctuary (with its vast farmlands, a Restaurant and shop) cares for hundreds of rescued donkeys and was a happy highlight of our time in Devon. Back in London Esther had successfully finished a deadline for her work publication. Several days before we left for India Esther and I met my penfriend Jean at Harlow Station. Jean’s son Paul transported us to his country home in Primly Lane where we met Paul’s wife and family plus their three playful spaniels. After this happy family gathering Jean and I said our fond farewells not knowing when we will meet again. On my second Sunday in London Esther took me to her Holy Trinity Church in Brompton. This large evangelical Church continues to reap the blessings of a wonderful move of God’s Spirit many years ago. The congregation is very multicultural and the worship heartfelt and inspiring. I loved the song they sang about our ‘Servant and King rescuing the world’. The preacher from Oxford spoke on this theme. Following this service and lunch at Harrods, we visited the amazing Victoria and Albert Museum with all its historic sculptures from the Renaissance. The next day Esther and I prepared for our first ever momentous visit to India!